Retroperitoneoscopy has been used for a variety of renal and adrenal procedures (Table 1). In patients with morbid obesity or peritoneal scarring from prior transabdominal procedures, retroperitoneoscopy allows a superior and more direct approach to the renal hilum. The equipment usually required for retroperitoneoscopic surgery is summarized in Table 2. Laparoscopic radical nephrectomy (15) and adrenalectomy (16) can be performed efficiently and effectively by either the transperitoneal or the retroperitoneal approach. 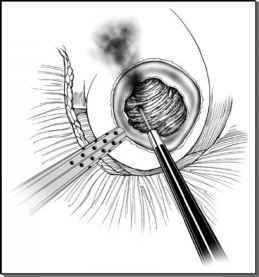 Control of the renal hilum may be quicker and total operative time shorter with the retroperitoneoscopic approach. Operative morbidity, postoperative complications, and pathological characteristics of the intact extracted specimen are similar with both approaches. As such, in most instances, the choice of approach depends on the comfort level, training, and preference of the individual surgeon.